When selecting a headset, you will see some that are labeled for fixed wing, panel power, helicopters, military or a variety of airline applications. This guide will help you choose the right aviation headset for your current application. And, if you change aircraft in the future (i.e. switch from an airplane to a helicopter), the headset adapters section below will allow you to protect your original headset investment. While browsing MyPilotStore, look for the icons below to help select the correct pilot headset. If you're ever in doubt, just give us a call toll-free at 877-314-7575 - we're more than happy to go over the various options with you. For most of the fixed wing (airplane) crowd, you'll be best served with the standard dual male plugs. These are known as the PJ-055 (.25 inch / 6.35mm) and PJ-068 (.206 inch / 5.25mm) plugs. The PJ-055 provides audio to the ear cups and the PJ-068 is for your microphone. These plugs will work in almost all civilian and commercial airplanes, even when other options might work as well. If you're in doubt, these are generally a safe bet. The PJ-055 is also known as the M642/4-1 and the PJ-068 is also known as the M642/5-1. 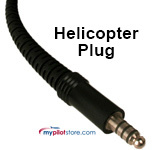 If you fly helicopters you'll most likely be looking for a headset with a single plug. It's slightly shorter and fatter than either of the fixed wing plugs. This single plug (7.1 mm / 0.281 inch diameter) provides both microphone and audio to the ear cups. It's generally known as a U-174/U plug or the U-93A/U plug (Nexus TP120). If you own an aircraft, or you fly something like a Cirrus or a newer Beechcraft, you might find a 6-pin circular type jack in your panel. This panel power plug is called a LEMO or Redel connector and is also referred to as a "Bose Style connector". This will allow you to plug any Redel equipped ANR (Active Noise Reduction) headset directly into the panel. This single 6-pin jack will provide audio, microphone, as well as power for the ANR in the headset so you can skip the batteries. If you own an aircraft that isn't setup with a panel powered option, you can purchase the panel power headset install kit and have your avionics shop install the jack in about an hour of shop time. Most airline and corporate pilots will still use the standard dual male plugs shown above. If you are flying an Airbus or select ATR aircraft you might find a single 5 pin XLR connector. 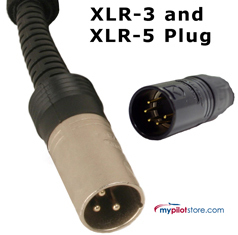 This XLR connector provides power, microphone and audio to a 5-pin XLR equipped headset. We have a variety of Airbus Headsets. You might find yourself flying aircraft that can supply power through the microphone tip in which case you could use either a standard dual plug headset or something like the Sennheiser HMEC-26-KP or the Telex Airman 850 to eliminate the battery requirements. Because the options for Airline and Corporate pilots can get a little more involved, we recommend that you call us at 480-556-0500 for additional questions. Most military aircraft - both fixed wing and helicopter - use a single plug called a U-93A plug which is the same size found in a civilian helicopter (U-174/U). Military headsets are generally low impedance instead of high impedance found in civilian aircraft. In other words, just because the plugs look the same does not mean you should not expect a civilian helicopter headset to work in a military aircraft - or vice versa. The most popular military headset is the David Clark H10-76 which often finds its' way into the civilian world (you'll need our H10-76 to civilian aircraft conversion kit). Browse our selection of Military Aviation Headsets. So what happens when you switch to a different aircraft or you pick up a used headset only to discover that it won't work in your aircraft? Don't worry! Most of the time we can convert almost any headset to work in whatever you are flying. No matter what type of headset you get, the cable from the plug(s) to the headset will be fairly similar. Almost all airplane headsets have a straight cord that is generally about five (5) feet long. Headset Extensions are available too. Many of the helicopter headsets will have a coiled cord, but some have a straight cord. It's a matter of preference. We carry a wide variety of Aviation Headsets from Bose, David Clark Headsets, LightSPEED Headsets, FlightCom Headsets, Sennheiser Aviation Headsets, AvComm / Ruigged Air, Sigtronics, Telex, and SoftComm. If you ever need assistance or helping deciding, please call us for advice (877-314-7575). You might also find our Pilot Headset Finder to be helpful as well as our Aviation Headset Comparison Tool.